Unlike sports which require strength, speed and power to be successful, distance running is primarily limited by the delivery and use of oxygen. There are no studies showing that strength training improves oxygen delivery from lungs to muscles. In fact, the resulting changes from strength and endurance training are contradictory. Strength training stimulates muscle fiber hypertrophy (growth). This may increase body weight, which increases the metabolic cost of running (more muscle requires more oxygen). Larger muscles also have a smaller density of capillaries and mitochondria, which is detrimental to endurance. Endurance training causes muscles to respond in an opposite fashion by increasing the number of mitochondria and capillaries to facilitate the use of oxygen. Endurance training also decreases body weight, optimizing oxygen use. Despite this seeming contraction, there is growing research demonstrating the value of “power training” as opposed to traditional “strength training.” Recent studies have shown, in subjects who used power training, running economy improved when subjects included explosive or heavy weight training in their training programs. Besides the documented positive increase in running economy one of the biggest advantages of all-out power workouts is that they flood your body with Human Growth Hormone (HGH). HGH is released in the body while sleeping so getting a good night’s sleep and even an occasional nap is a strategy athletes have used for years to maximize recovery and to ultimately, perform better. Many bodybuilders and anti-aging types frequently take artificial injections of HGH at a very high financial cost. HGH production decreases as we age so it is probably even more important to the masters athlete. Sprinting and power training has been shown to be “anabolic” or aiding in building up tissues in the body. Long distance training tends to be catabolic which is the breaking down of tissues. Power training is done with weights in a weight room using heavy weights ( >85% of one-rep max), and fast speeds for 3 to 4 sets of 5 to 6 reps. Another popular method uses plyometrics which includes jumping and bounding exercises involving repeated, rapid eccentric and concentric muscle contractions. This is shown to improve running economy and 5K running times. 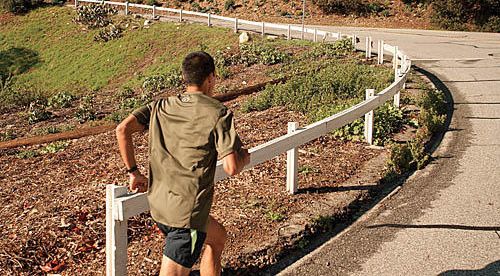 I’m trying Hill Sprints as my form of power training for running (I think this most closely replicates the action of regular running plus it’s easy for me to get to a short hill perfect for this kind of workout.) and 25 yard sprints in the pool. So far I can report no problems with knees or shoulders. In fact, I’ve decided the uphill effort doesn’t seem to stress my knee at all – we shall see. The workouts are a lot different from anything I’ve done before. Think about the last time you ever ran as hard as you could go with absolutely no pacing yourself – all out for 20 or 30 seconds. I’ve felt great this week and I’m kind of excited about trying something brand new after all these years.